Say goodbye to the effects of sun damage, rosacea, hyperpigmentation, and more! With the innovative Intense Pulsed Light (IPL) photo-facial procedure, gentle skin rejuvenation is now easier than ever. Laser photo facial is the latest in modern dermatology, allowing patients to transform red, blotchy skin into a radiant complexion. If you suffer from any of these problems, photo-facial treatments may be the dermatological approach you've been looking for. 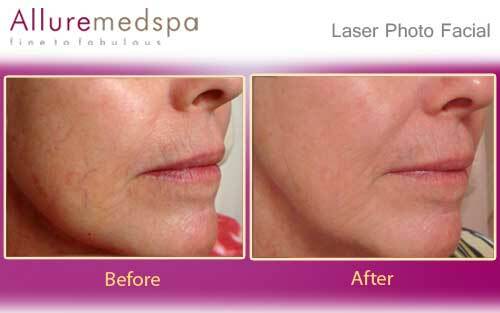 The IPLTM photo-facial skin procedure involves the use of an intense beam of broad-spectrum light (as opposed to lasers, which operate within a very specific wavelength) that targets the dermis, the lower layer of the skin. The procedure simultaneously removes damaged and photo-aged skin while stimulating collagen growth. Before the procedure begins, you will be given protective eyewear to protect you from the bright flashes of light. A cool gel is often applied to the treatment area, both to lubricate the hand-piece and to help cool the epidermis during the treatment. Your skin care specialist will apply brief pulses of bright light to the skin through the hand-piece. Depending on the size of the area being treated, the procedure may take anywhere from a few minutes to an hour. IPLTM photo-rejuvenation therapy can improve the color, consistency, and texture of the skin all at once. The procedure is also quick and involves no downtime, making it a convenient option for people with busy schedules. During IPL photo-rejuvenation treatment, high energy light waves are used to reduce or eliminate many common effects of aging, including facial wrinkles and skin discolorations. IPL light also encourages the production of collagen, a natural protein that fills in wrinkles, making the skin smooth and supple. 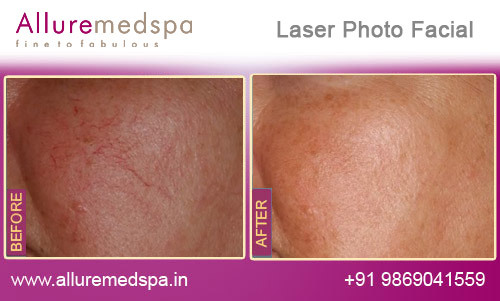 With each treatment, the results of IPL photo-rejuvenation become more pronounced. The face is extremely important as it’s the first thing that people notice about you. Every individual rightfully aspires to look good in a youthful and natural way. At Allure MedSpa, we assimilate impeccable artistic vision and best technological breakthroughs in dermatology to enhance the natural exquisite beauty of your skin. With its outstanding team of Dermatologists, Allure MedSpa helps you neutralize frown lines, wrinkles, fine lines and scars and plump out your lips and cheeks in its state-of-the-art facilities at highly affordable, value for money prices. No wonder, patients from all over the world throng Allure MedSpa to achieve their cosmetic and skincare goals. Skin elasticity and skin strength: For many of us the ageing process results in loose and thinning skin. Volume: Some areas of the face require more padding to maintain shape and support of the face. Surface texture and skin ‘clarity’: Creating a more uniform complexion is multifactorial in itself. Dynamics of facial expression: Excessive movement of frown lines is not the only aspect of anti-wrinkle treatments. There is a myriad of minor therapies that can reduce unwanted affects such as the ‘the gummy smile” and down-turning of the corners of the mouth. During the IPLTM photo-facial procedure, you will feel a warm sensation caused by the hand-piece. Some patients liken the sensation to a light "snap" from a rubber band. The number of pulses you receive will depend on the size of the area being treated. Following the procedure, your skin care specialist may help you in icing down the treatment area to help soothe any discomfort from the procedure. This is often unnecessary, however, as IPLTM photo-facial treatment causes very little pain. No two people are the same. So it follows that no treatment plan for facial rejuvenation and skincare will be uniformly the same either. 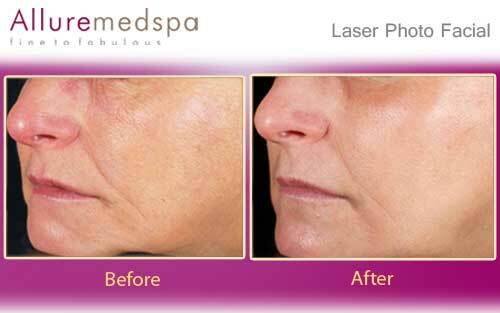 Laser photo Facial is a personalized treatment that is tailored to the individual. To preserve the uniqueness of every client aesthetically, we offer each patient a customized plan to cater to his/her unique face and issues. The side effects of photofacial treatment dissipate within a few hours for many patients. For some patients, however, the redness or dark spots may take a week to fade. Patients treated for severe acne sometimes experience longer recovery times, though they are often amazed by the results when the side effects wear off. It will take several hours to a day or so for the treatment's results to become noticeable. Though recovery from Laser photo-facial is rapid, it is important to keep in mind that sunscreen is vital to ensuring the results of the procedure last as long as possible. Be sure to protect the treated area from the sun for at least a couple of weeks, either by covering the area or wearing strong sunscreen. 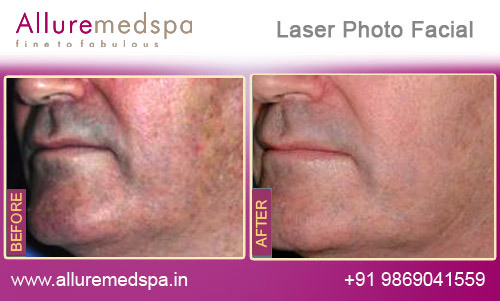 Most benefits of a photo-facial occur gradually in the weeks following treatment. A photo-facial is a 30-minute procedure. Depending on the area being treated and the severity of the problem, multiple treatment sessions may be recommended. For many problems, physicians will recommend between three and five treatments. If the proper steps are taken to maintain the improvements, the results of your treatment may last up to a year or longer. Allure MedSpa which is renowned for its state-of-the-art internationally acclaimed services,offers affordable and cost effective skin rejuvenating procedures. To know more about the cost of your procedure request a consult by filling the form below.Your consultation is your chance to ask questions about Face Rejuvenation treatments and put your mind at rest. Our surgeons and cosmetologists will be there to offer full explanations and answers to all of your queries. People who have blotchy, sun-damaged, or discolored skin, or whose skin is affected by large pores, freckles, or wrinkles, may be ideal candidates for a photofacial. 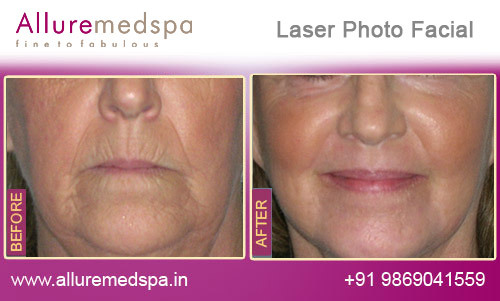 People with white, untanned skin that is still somewhat elastic are the best candidates for an photofacial. Those with dark or deeply tanned skin sometimes experience complications following photo-facial treatment. Patients should discuss such issues with a trained dermatologist before undergoing treatment. Our renowned Dermatologist and the outstanding team at Allure MedSpa will equip you with a comprehensive knowledge about the procedure options, enabling you to take a well-informed decision. People who are taking the medication Accutane should not have an IPLTM photofacial until at least six months after they stop using the drug. Pregnant women should also postpone treatment until after they give birth.